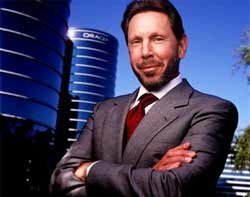 Oracle’s Larry Ellison has resigned as chief executive after 35 years at the helm of the company he co-founded in 1977 with Bob Miner and Ed Oates. But Ellison will remain as executive chairman and chief technology officer. Jeff Henley, who has served as Oracle's chairman for the past 10 years, will become Oracle's vice chairman. Under his leadership, the company has become the world’s largest database supplier and one of the biggest enterprise software businesses, currently valued at $182.7bn. Oracle co-presidents Safra Catz and Mark Hurd are to become joint CEOs to replace Ellison. Catz will remain chief financial officer and oversee legal and manufacturing operations, while Hurd will run sales, marketing and strategy. Ellison, whose fortune is estimated at $51.4bn, remains Oracle’s largest shareholder, holding 1.1bn shares, or 25%, of the company. Catz has been instrumental in many of Oracle’s biggest acquisitions including its $10.3bn takeover of PeopleSoft and the $7.4bn deal for Sun Microsystems. Hurd joined Oracle as president in 2010 when he left Hewlett-Packard after an internal investigation revealed that irregularities in his expenses claims were used to cover up a “close personal relationship”. At the time, Ellison came out in strong support for Hurd, criticising the HP board for forcing him to quit. In the four years that Hurd was HP CEO, the company’s shares doubled in value. “Safra and Mark will now report to the Oracle board rather than to me. All other reporting relationships will remain unchanged,” Ellison said in a statement. “The three of us have been working well together for the last several years, and we plan to continue working together for the foreseeable future. Keeping this management team in place has always been a top priority of mine,” he said. Oracle board president Michael Boskin said: "Larry has made it very clear that he wants to keep working full time and focus his energy on product engineering, technology development and strategy." The charismatic Ellison has also used his Oracle wealth to branch outside the IT world. His yachting team won the America's Cup in a dramatic finish in 2013, and he made a cameo appearance in the super-hero movie Iron Man 2.